Bilingualism or the ability to speak more than one language is a prevalent linguistic phenomenon. Even in the online digital discourse a great deal of multilingualism and bilingualism is observed in text-mediated interactions between users. For those of you interested in learning more about bilingualism in the virtual world, we recommend Language Online: Investigating Digital Texts and Practices (by David Barton and Carmen Lee) and The Multilingual Internet: Language, Culture, and Communication Online (by Brenda Danet and Susan C. Herring). Both of these books provide some interesting academic studies with illustrated explanations of how Internet users appropriate their linguistic codes in different multilingual spaces. 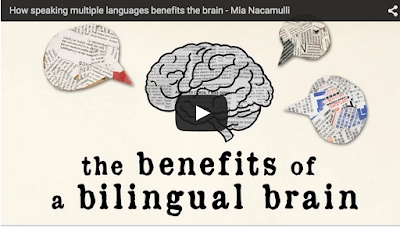 To learn more about bilingualism, this Ted Ed lesson, we discovered through LarryFerlazzo, does a great job explaining what bilingualism is all about, its types and its cognitive benefits. Higher density of the gray matter that contains most of your brain’s neurons and synapses. The heightened workout a bilingual brain receives throughout its life can help delay the onset of diseases such as alzheimers and dementia by as much as five years. The efforts and attention needed to switch between languages trigger more activity in and strengthens the dorsolateral prefrontal cortext which is the part of the brain responsible for executive functions, problem solving, switching between tasks, and focusing while filtering out irrelevant information.